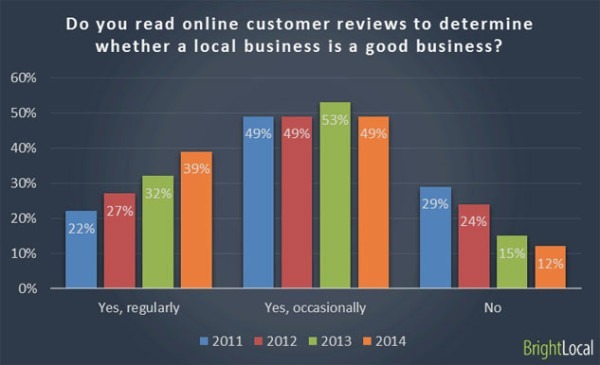 How customer reviews can help your local SEO efforts. Reviews are a massive part of the web now, and an absolute essential for online retailers. They’re also vital for local businesses, whether or not they sell online, thanks to their sheer prominence in local search results. After this the next organic listings are mainly from review sites – Yelp, TripAdvisor, Time Out, Zagat, and so on. Only a couple of actual restaurant sites make it onto the first SERP. While not every local search is exactly like this, the trend is clear. Indeed, the Google My Business listings are so dominant that many users will not even look at the other organic results. In summary, if you want a prominent position in the local SERPs, you need user reviews. If you want to encourage clickthroughs, or physical visits, you need good reviews. In a nutshell, it’s the power of social proof. People need reassurance and confirmation that their actions are the right ones. So, when people are thinking about buying a particular camera, seeing an average review rating of 4 stars, or reading positive reviews may provide the extra push they need. For local searches, if you see a restaurant with an average score of 4.6 from 465 reviews, like the Girl & the Goat above, then it looks like a safe choice. There are so many stats around reviews that I could pluck almost any number out to show how many read them before buying, how they are trusted more than other sources, and so on. The bottom line is that they are used a lot and relied upon by many web users. This, from BrightLocal’s local consumer review survey, is relevant to this article. 88% read reviews to determine the quality of a local business. There are a number of review sources that Google can use, or which play a part in local search visibility. This is the most important source. These review scores are an important signal for Google. Indeed, Moz attributes review signals 8.4% of its ranking factor pie. A Google My Business listing is now an absolute essential for local search. It’s free to set up, it’s one of the best things you can do to improve local SEO visibility. Also, you don’t need to be an SEO expert, or to hire one to get the basics right. You’ll find plenty more tips in Greg Gifford’s excellent presentation from Brighton SEO this year. For Google to show your reviews, you’ll need at least five reviews, while Greg recommends at least 10 Google reviews before you target other sources. It also helps if you have more than your competitors. While Google’s reviews may be the most important, this doesn’t mean you should ignore other sites. Together, they create signals and links that tell Google about the relevance of your business, as well as increasing your search visibility. Reviews on multiple sites also back up the information on the Google reviews. This shows users (and Google) that you haven’t just been targeting reviews, but you have a business that people like. If we look below the fold on the results for ‘Chicago restaurants’ then we can see that the Google reviews were no fluke. If I owned a restaurant, this is the kind of search results page I’d love to see for my business. It dominates most of the page, and there are so many positive signals for prospective customers. Well, one option is to just sit and wait for the sheer brilliance of your business or products to drive people to leave glowing reviews, but let’s be more pro-active than that.. If you’re business doesn’t care about its customers and providing a quality product or service, forget about attracting positive reviews. Instead, get ready for lots of negative reviews. You can’t fake it. Even if you ask all your friends and staff to leave a nice review the truth will come out. If you want reviews, concentrate on providing the best possible customer experience. That’s the most important thing you can do. Most customers will only feel compelled to leave a review when they’ve had either a great or terrible experience. Make sure it’s the former. Hand our cards, print it on receipts, ask customers as they’re paying the bill. Don’t be shy. Many stores offer the incentive of entry into prize draws for leaving reviews, but this isn’t a good idea as this is against Google’s and most review site’s guidelines. If you have customers’ email addresses, then send them a follow up email can be effective. They’re on the web to answer the email anyway, so it’s less effort to head to leave a review online. If you have a decent following, then the occasional post or tweet asking for reviews can work. Don’t overdo it though. Maybe not all, as some people will never be placated. However, if you respond to criticism in a reasonable way, seeking to understand the customer’s issue and resolve it if possible, this leaves a positive impression. Put up signs around stores, asking for reviews on various sites. Leave flyers around, it all helps. This is another excellent tip from Greg Gifford’s presentation, and one which makes it easier for customers to leave reviews. Here’s an (old) example – note that reviews on Google are prioritised though, after Yelp, the others may not be so relevant now. The URL for this page can be used on the flyers and emails I’ve mentioned, and it means you can point customers at the right page to leave reviews, and add brief instructions.